Quarter-scale sea tests of Minesto’s unique technology for producing electricity from low-velocity ocean and tidal currents, Deep Green, has been ongoing at Minesto’s test facility in Northern Ireland since 2013. The test results now surpass previously noted maximum levels of electricity generation. 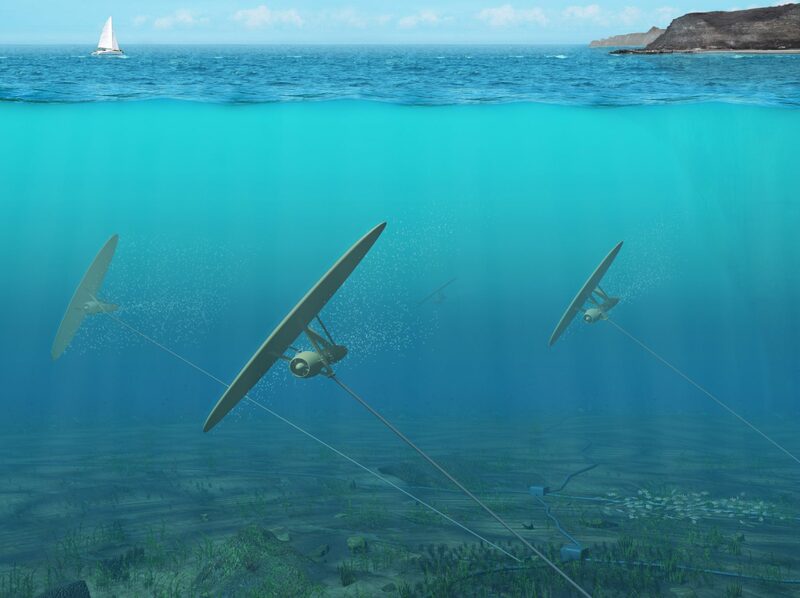 The illustration suggests that Minesto turbines will move with the current. In tests, the quarter-scale model generated an output of more than 3 kW in a 0.8 m/s tidal current. Following technical development progress in design and control system, the kite is flying with higher trajectory precision than before – which means improved electricity production performance”, says Dr Heije Westberg, CTO at Minesto. In the tests which Dr Westberg refers to, the quarter-scale model generated an output of more than 3 kW at a tidal current velocity of 0.8 m/s. The results correspond to full power production for a full-scale 0.5-MW power plant at 1.75 m/s current velocity. These conclusions are consistently drawn from three independent computational models which Minesto use for simulating full-scale performance. “This means that our quarter-scale tests indicate adequate power generation performance for the corresponding design of the power plant at full scale. It reduces technical risks in our full-scale project and further strengthens our belief in the commercial viability of the Deep Green technology”, says Dr Martin Edlund, CEO of Minesto. “We now move forward to see how we through various test methods and simulation can increase performance of the technology further. The next step is to, in the weeks to come, begin testing of a new improved wing design”, says Dr Heije Westberg.